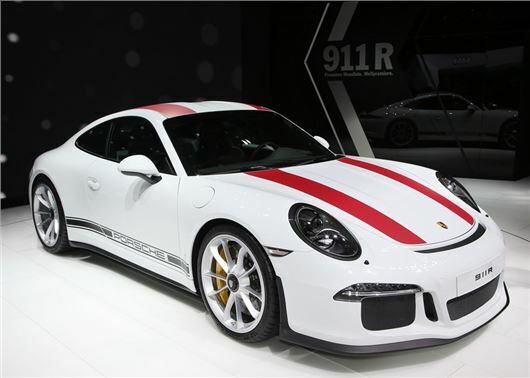 This is the Porsche 911 R, unveiled in Geneva today as a sort of peace offering to those all upset about the 911 going turbo. It’s got the naturally aspirated 500PS 4.0-litre engine from the 911 GT3 RS in its backside, a lightweight body, and is available only with a manual gearbox. Available now for £136,901 exactly, order one and you’ll have it by June – but do it quickly, because only 991 are being made worldwide. The name comes from 1967’s 911 R, a homologation special, and although it’s plenty quick (0-60mph in 3.7 seconds) it’s actually produced to provide the peak 911 dynamic experience more so than outright speed. For that reason it gets a short-throw manual gearbox, ceramic composite brakes, ‘ultra high-performance’ tyres, a specially tuned rear axle and stability management system, carbon fibre bonnet and wheel arches, a magnesium roof, forged aluminium wheels, carbon fibre bucket seats, plastic side and rear windows, reduced sound dampening and no rear bench. It also features a lift function so it can get over speed humps without the custom front bumper being torn off, and both the stereo and air conditioning are optional, which tells you something of the dedication to weight loss here; you wouldn’t find Cheryl Fernandez-Versini weighing herself with a protein shake in her hand, right? All that weight saving makes the 911 R 50kg lighter than the 911 GT3 RS, and virtually guarantees it will take its place in the upper echelons of all 911s past and present on the dynamics scale. It will also top 200mph by a solitary mile, and it returns 21.2mpg average. The red stripes you see are standard, although you can have them in green if you prefer, while the retro seat fabric is in homage to the original 911. And in a nod to other GT 911 models, Porsche guarantees you’ll be touching the cloth when you exit the car – the door pulls are fabric.